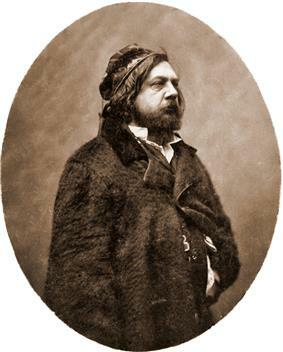 Pierre Jules Théophile Gautier (French: ; 30 August 1811 – 23 October 1872) was a French poet, dramatist, novelist, journalist, and art and literary critic. While Gautier was an ardent defender of Romanticism, his work is difficult to classify and remains a point of reference for many subsequent literary traditions such as Parnassianism, Symbolism, Decadence and Modernism. He was widely esteemed by writers as diverse as Balzac, Baudelaire, the Goncourt brothers, Flaubert, Ezra Pound, T. S. Eliot, Henry James, Proust and Oscar Wilde. 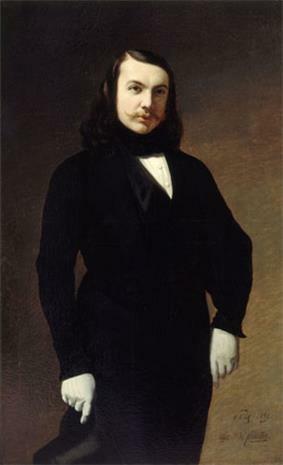 Gautier was born on 30 August 1811 in Tarbes, capital of Hautes-Pyrénées département in southwestern France. His father was Pierre Gautier, a fairly cultured minor government official, and his mother was Antoinette-Adelaïde Concarde. 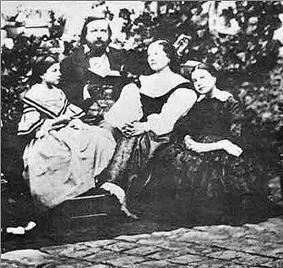 The family moved to Paris in 1814, taking up residence in the ancient Marais district. While at school, Gautier befriended Gérard de Nerval and the two became lifelong friends. It is through Nerval that Gautier was introduced to Victor Hugo, by then already a well-known, established leading dramatist and author of Hernani. Hugo became a major influence on Gautier and is credited for giving him, an aspiring painter at the time, an appetite for literature. It was at the legendary premier of Hernani that Gautier is remembered for wearing his anachronistic red doublet. Gautier was a celebrated abandonné (one who yields or abandons himself to something) of the Romantic Ballet, writing several scenarios, the most famous of which is Giselle, whose first interpreter, the ballerina Carlotta Grisi, was the great love of his life. She could not return his affection, so he married her sister Ernestina, a singer. Absorbed by the 1848 Revolution, Gautier wrote almost one hundred articles, equivalent to four large books, within nine months in 1848. Gautier experienced a prominent time in his life when the original romantics such as Hugo, François-René de Chateaubriand, Alphonse de Lamartine, Alfred de Vigny and Alfred de Musset were no longer actively participating in the literary world. His prestige was confirmed by his role as director of Revue de Paris from 1851–1856. During this time, Gautier left La Presse and became a journalist for Le Moniteur universel, finding the burden of regular journalism quite unbearable and "humiliating". Nevertheless, Gautier acquired the editorship of the influential review L’Artiste in 1856. It is in this review that Gautier publicized Art for art's sake doctrines through many editorials. Gautier spent the majority of his career as a journalist at La Presse and later on at Le Moniteur universel. He saw journalistic criticism as a means to a middle-class standard of living. The income was adequate and he had ample opportunities to travel. Gautier began contributing art criticism to obscure journals as early as 1831. It was not until 1836 that he experienced a jump in his career when he was hired by Émile de Girardin as an art and theatre columnist for La Presse. During his time at La Presse, however, Gautier also contributed nearly 70 articles to Le Figaro. After leaving La Presse to work for Le Moniteur universel, the official newspaper of the Second Empire, Gautier wrote both to inform the public and to influence its choices. His role at the newspaper was equivalent to the modern book or theatre reviewer. Gautier's literary criticism was more reflective in nature, criticism which had no immediate commercial function but simply appealed to his own taste and interests. Later in his life, he wrote extensive monographs on such giants as Gérard de Nerval, Balzac, and Baudelaire, who were also his friends. From a 21st-century standpoint Gautier's writings about dance are the most significant of his writings. The American writer Edwin Denby, widely considered the most significant writer about dance in the 20th century, called him "by common consent the greatest of ballet critics." Gautier, Denby says, "seems to report wholly from the point of view of a civilized entertainment seeker." He founds his judgments not on theoretical principles but in sensuous perception, starting from the physical form and vital energy of the individual dancer. This emphasis has remained a tacit touchstone of dance writing ever since. Through his authorship of the scenario of the ballet Giselle, one of the foundation works of the dance repertoire, his influence remains as great among choreographers and dancers as among critics and balletomanes [devotees of ballet]. La Comédie de la Mort, published in 1838, is a period piece much like Albertus. In this work, Gautier focuses on the theme of death, which for Gautier is a terrifying, stifling and irreversible finality. Unlike many Romantics before him, Gautier's vision of death is solemn and portentous, proclaiming death as the definitive escape from life's torture. During the time he wrote the work, Gautier was frequenting many cemeteries, which were then expanding rapidly to accommodate the many deaths from epidemics that swept the country. Gautier translates death into a curiously heady, voluptuous, almost exhilarating experience which diverts him momentarily from the gruesome reality and conveys his urgent plea for light over darkness, life over death. Émaux et Camées (1852), published when Gautier was touring the Middle East, is considered his supreme poetic achievement. The title reflects Gautier's abandonment of the romantic ambition to create a kind of "total" art involving the emotional participation of the reader, in favour of a more modern approach focusing more on the poetic composition's form instead of its content. Originally a collection of 18 poems in 1852, its later editions contained up to 37 poems. Gautier did not consider himself to be dramatist but more of a poet and storyteller. His plays were limited because of the time in which he lived; during the Revolution of 1848, many theaters were closed down and therefore plays were scarce. Most of the plays that dominated the mid-century were written by playwrights who insisted on conformity and conventional formulas and catered to cautious middle-class audiences. As a result, most of Gautier's plays were never published or reluctantly accepted. La Fausse Conversion (1846) ("The False Conversion") is a satirical play written in prose. It was published in the Revue Des Deux Mondes on March 1. As with many other Gautier plays, the drama was not performed in his lifetime. It takes place in the 18th Century, before the social misery that preceded the French Revolution. La Fausse Conversion is highly anti-feminist and expresses Gautier's opinion that a woman must be a source of pleasure for man or frozen into art. 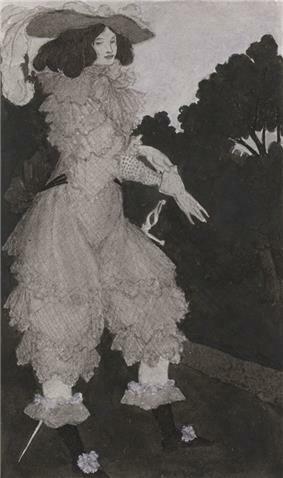 The fictional Mademoiselle de Maupin, from Six Drawings Illustrating Theophile Gautier's Romance Mademoiselle de Maupin, by Aubrey Beardsley, 1897. Mademoiselle de Maupin (1835) In September 1833, Gautier was solicited to write a historical romance based on the life of French opera star Mlle Maupin, who was a first-rate swordswoman and often went about disguised as a man. Originally, the story was to be about the historical la Maupin, who set fire to a convent for the love of another woman, but later retired to a convent herself, shortly before dying in her thirties. Gautier instead turned the plot into a simple love triangle between a man, d'Albert, and his mistress, Rosette, who both fall in love with Madelaine de Maupin, who is disguised as a man named Théodore. The message behind Gautier's version of the infamous legend is the fundamental pessimism about the human identity, and perhaps the entire Romantic age. The novel consists of seventeen chapters, most in the form of letters written by d'Albert or Madelaine. Most critics focus on the preface of the novel, which preached about Art for art's sake through its dictum that "everything useful is ugly." Le Capitaine Fracasse (1863) This book was promised to the public in 1836 but finally published in 1863. The novel represents a different era and is a project that Gautier had wanted to complete earlier in this youth. It is centered on a soldier named Fracasse whose adventures portray bouts of chivalry, courage and a sense of adventure. Gautier places the story in his favourite historical era, that of Louis XIII. It is best described as a typical cloak-and-dagger fairy tale where everyone lives happily ever after. 1871: Tableaux de Siège: Paris 1870-1871.